I love Christmas! And nothing sounds like Christmas more than the jingling of bells. This year I had the idea to make my daughter a special Merry Christmas skirt to help her practice her dance moves (more on that another day) and spread the jingling sounds of this holiday season! Here is the finished product. It was SO easy to make. And my daughter loves it- she runs around the living room in circles wearing this! Step 2: Go to the craft store and purchase rolls of green and red tulle. 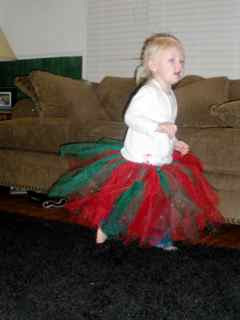 I used four rolls (2 red and 2 green) because I like my tutus nice and fluffy! Step 4: Cut several ribbons twice the length of the skirt. Tie small jingle bells on to both ends. It may help to use a strong adhesive to ensure that the bell will stay on the ribbon. I just tied a double knot and it has been holding up fine. Then attach the jingle bell ribbons to various places throughout the skirt using the same knot as the tulle. You could use this tutu for so many things- Christmas parties, family night dance performances, or just plain fun around the house! This entry was posted in celebrations, Christmas, homemade gifts and tagged Tumbling Tuesday on November 21, 2010 by ktoponce.